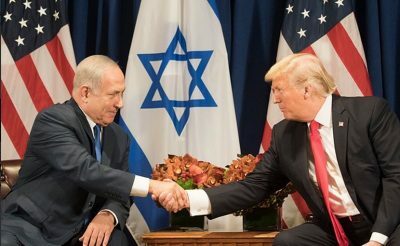 Donald Trump’s decision to exit from the Joint Comprehensive Plan of Action (JCPOA) agreement on Iranian nuclear capability is in keeping with his doctrine of joining Israel at the hip of the United States. Fealty to the state of Israel is a constant in United States foreign policy. Every president who has served since that country was founded has given it carte blanche to do anything it wants but Trump goes further than anyone else. Most of the acquiescing is done out of cynicism and the need to placate influential supporters who can and do choose who may hold elective office, including the presidency. But Donald Trump is different. He is the one true believer in Israeli’s right to reign supreme in its region and in command of American foreign policy. Other presidents may have said they were willing to move the embassy to Jerusalem but Trump is the one who will actually do it. Trump had resisted leaving the JCPOA agreement but finally stopped listening to aids, Congress, and European allies and completely succumbed — as he wanted to do all along. Trump’s love for Israel makes him committed to opposing both Iran and his predecessor’s legacy at every turn. It is therefore not surprising that an Israeli security firm, Black Cube , spied on two Obama administration officials and the head of an Iranian advocacy group in hopes of discrediting them and the agreement. Black Cube was most recently in the news as the spy agency hired by former movie mogul Harvey Weinstein to investigate women who accused him of sexual assault. The firm is surely an arm of the Israeli government’s Mossad security agency. In fact, its founders are all former Mossad agents and that is its claim to fame. Ben Rhodes and Colin Kahl were both negotiators to the JCPOA agreement that Donald Trump hates so much. Trita Parsi is president of the National Iranian American Council. It will be interesting to see if any Democrats will speak up about the Black Cube/Israeli government spying on Kahl, Rhodes, Parsi and their families. A case can certainly be made that an official investigation should be undertaken. Robert Mueller claims that his mandate allows him to go far beyond the question of collusion between Trump and the Russian government. If he can indict former campaign manager Paul Manafort and charge him with acts that have nothing to do with Russia he can surely do the same regarding Black Cube. One of the alleged smoking guns in the Russiagate saga is actually connected to the Israeli government. Former national security adviser Michael Flynn lied about contacting the Russian ambassador to the United Nations. But the communication happened at the behest of Israel who wanted to secure Russian support for Israel in a Security Council vote. Perhaps the well known moniker should be changed to Israelgate. Israel is not alone in making desperate attempts to hold the empire together. France, the United States and the United Kingdom outdo one another making false claims about chemical weapons in Syria and they all worked together to destroy Libya. The neocon plan for a new American century has been in the works for years as secular Arab nations fall to NATO invasions and interventions and always with Israel’s help. Ultimately Israel wants to instigate an American attack on Iran and a Trump presidency is their best chance to make that happen. Benjamin Netanyahu’s periodic public relations campaigns against Iran are meant to ratchet up the political pressure. Israel and the other nations who worked for Syrian regime change have failed. President Assad is firmly in place. He is resolved to free his country from Israeli and U.S. backed terrorists and Vladimir Putin is committed to helping him. Israel wants to scuttle as much as it can and get Trump to do their dirty work. Democrats may not be true lovers of Israel but they are craven and unlikely to rock the boat. The story of collusion is the same. Saudi Arabian crown prince Mohammed Bin Salman slaughters Yemenis but his friendship with the United States gives him and his public relations juggernaut cover. Congress and the corporate media always roll out the red carpet for the killer prince. One needn’t know history to figure out who is a friend of the United States government and who is a foe. But the ruling elite can’t be allowed to make that decision for everyone else. In fact we should know that the friends of the empire are the enemies of the people. There are plenty of other enemies who work with American presidents to undermine national sovereignty and human rights all over the world. Israel is just the most blatant and most successful of them all. Margaret Kimberley’s Freedom Rider column appears weekly in BAR, and is widely reprinted elsewhere. She maintains a frequently updated blog as well here. Ms. Kimberley lives in New York City, and can be reached via e-Mail at [email protected]. Featured image is a White House photo.